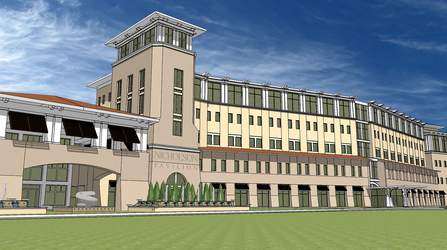 Winter Park Memorial Hospital announced its vision for the new $85 million Nicholson Pavilion, which will add up to 80 all-private rooms, as well as a new patient lobby. The five-story, Mediterranean-inspired pavilion will be named for philanthropists Tony and Sonja Nicholson. Construction is set to begin this winter, with a completion date of 2018. Local and federal officials joined the Nicholsons and Winter Park Memorial Hospital officials for the historic day. The Nicholson Pavilion expansion will allow the hospital to convert the majority of its existing rooms into private patient rooms, today’s gold standard in care. The new pavilion space will include private beds for orthopaedic care as well as other surgical and medical services. At full buildout, it will offer 160 beautiful private rooms and bathrooms. When Winter Park Memorial Hospital opened its doors in 1955, about 12,000 people called Winter Park home. The first ambulance was a hearse run by a funeral home. Ninety doctors treated patients at the 58-bed facility. Today, nearly 30,000 residents live in Winter Park, and thousands more in surrounding areas. Winter Park Memorial Hospital is the largest employer in the city, with almost 1,400 employees. The hospital performs nearly 10,000 surgeries, more than 75,000 outpatient visits and more than 16,000 inpatient admissions per year. “As an almost 50-year resident of Winter Park and a patient at times of this hospital, I know this new pavilion will bring to Winter Park a facility that will meet the needs of our community for a long time to come,” said Tom Yochum, the Winter Park Memorial Hospital Foundation board president. The state-of-the-art community hospital is home to destination services such as the Dr. P. Phillips Baby Place, Florida Hospital for Women at Winter Park Memorial Hospital, the Cancer Institute, Orthopaedic Institute, and the Minimally Invasive & Robotic Surgical Center.